I’ve discussed the Inferno e-cigarette on Vapegrl previously, but haven’t given it a full review before now. It’s one of the most popular e-cigarettes currently on the market, undoubtedly because it’s such an effective compromise between all of the qualities that matter to e-smokers: performance, size, battery life and price. Today, I’d like to discuss the Inferno e-cigarette in detail and explain why I believe it’s such a good buy. See the Inferno at Volcano’s website or click here to shop in Europe. It costs 79.99 and ships anywhere in the United States for free. The Inferno e-cigarette is a really interesting package because it’s put together in a way that’s obviously designed to appeal to experienced e-smokers — this isn’t designed to be your first electronic cigarette, it’s designed to be the one you upgrade to once you’ve tried e-smoking, decided that you like it and want to step up to the next level in vapor production and battery life. I used the Inferno for more than a year after stepping up from my first e-cigarette and can definitely confirm it serves that purpose perfectly. Volcano also upgraded the Inferno e-cigarette in 2012, which is a great thing for you if you haven’t bought yours yet. The new package includes a 900 mAh battery and 650 mAh battery, both of which have the ability to draw power from your computer’s USB port and keep working even if they need to be recharged. The kit also includes a wall charger, a USB cable and an accessory called the Tube Tank — which I’ll talk about in a minute — along with five extra cartomizers, a bottle of e-liquid and a little metal ring to protect the Tube Tank while it’s connected to the battery. In the new 2012 Inferno, Volcano has also given the battery a classy new design. The kit is available with black, silver, red, blue and pink batteries. 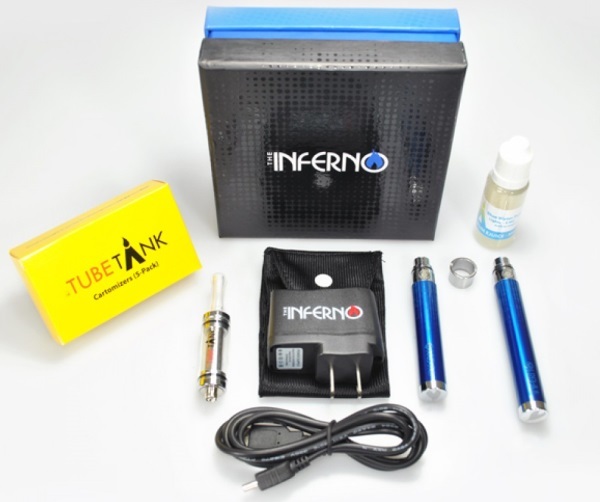 The Tube Tank is the thing that really makes the Inferno e-cigarette different from the other eGo packages available. It holds about a quarter of a bottle of e-liquid, which is great because you can essentially fill it once and then forget about it for days. Volcano has worked hard on improving the Tube Tank over the last several months, and having tried the current version I have to agree that it’s better than ever. To have the best experience with the Inferno e-cigarette, add a needle tip bottle top to your cart before you check out. You’ll want to replace the original tip of the bottle with the needle tip, then push the cartomizer out of the Tube Tank to fill it. Just stick the needle between the polyfill and the cartomizer’s metal wall, squeeze gently and turn the cartomizer when you can see the e-liquid bubbling up through the of the filling. Once the filling is nice and wet, push the cartomizer almost all of the way back into the Tube Tank, fill the tank almost up to the top and push it closed. 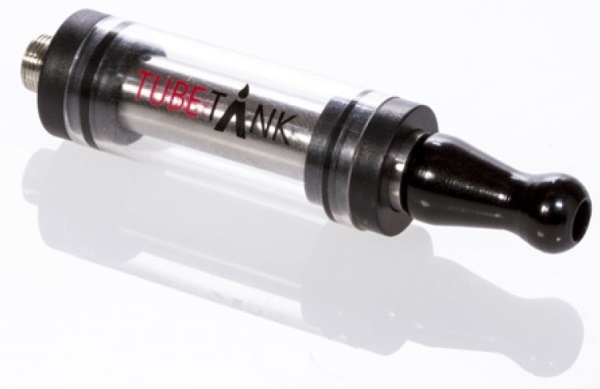 Put the mouthpiece — included with the Inferno e-cigarette — into the top of the Tube Tank. You’re almost ready start using the Inferno now; just place the metal ring over the threads at the top of the battery and screw the Tube Tank tightly into place. To use the Inferno e-cigarette, hold the button down and inhale through the mouthpiece at the top of the Tube Tank. So, now you know how to use the Inferno e-cigarette, but that’s probably not the question on your mind. What’s more important is how well it works, right? To understand what gives the Inferno its better performance compared to small e-cigarettes, think about how e-cigarettes work; you’ve got an atomizer or cartomizer with a heating coil. You apply battery power and the coil turns on, heating the e-liquid and giving you a puff of vapor to inhale. Now, suppose you had a slightly longer cartomizer. Instead of one heating coil, now you’ve got two working at the same time. This means you’re going to get twice as much vapor — but more importantly, you’re doing it without increasing the voltage of the battery. So, not only are you getting more vapor with the Inferno e-cigarette, but you’re also getting it without any hot, dry harshness. If you look closely at Volcano’s Inferno pictures, you might notice that the cartomizer has a little hole in the side, near the bottom. This enables the Tube Tank to keep the cartomizer fed with e-liquid for days; the filler in the cartomizer becomes dry as you use the Inferno, naturally drawing e-liquid from the tank via osmosis. For most e-smokers, a full tank is at least a 2-3 day’s supply of e-liquid. As long as the cartomizer continues to deliver good vapor production, you can keep it full simply by topping the tank off when it starts to get low. In a nutshell, I think that the Inferno e-cigarette is a great choice for e-smokers. Buy the Inferno now if you’re already an e-smoker and think that you’d enjoy your e-cigarette even more if you could get just a bit more vapor and battery life out of it. Alternatively, if you’ve never used e-cigarettes before, take a look at my recommendation for the best e-cigarette for beginners.